The Times of Israel liveblogged events here as they unfolded through Wednesday, the ninth day of Operation Protective Edge. Ceasefire talks gathered pace, but the hostilities continued unabated. Thursday’s liveblog is here. Remember, you can also follow @TOIAlerts on Twitter — we’re live-tweeting all the updates there as well. The Israeli man killed earlier on Tuesday in a rocket attack near the Erez crossing is named as 37-year-old Dror Khenin from the West Bank settlement of Beit Aryeh, east of Tel Aviv. Khenin became the first Israeli to die in Operation Protective Edge when he succumbed to injuries inflicted in a mortar attack while distributing food to the soldiers near the Erez crossing. Another man was lightly wounded in the attack. Music star Rihanna tweets, then quickly deletes, support for the Palestinian cause Tuesday with a message on her social media account which read #FreePalestine. While the tweet no longer appears on her Twitter feed, it was archived online here. Fresh Israeli airstrikes early Wednesday morning have targeted the home of senior Hamas official. According to a report in Ynet, the air force struck the home of Fathi Hamad, a former Hamas interior minister in the Gaza Strip. Another as yet unconfirmed report says that Israel also struck the home of Palestinian MP and senior Hamas official Ismail al-Ashqar. There’s no immediate report of casualties. The reports came shortly after the Israeli military notified 100,000 residents of the northern Gaza Strip to evacuate their homes by 8 a.m. Wednesday ahead of airstrikes. A senior Israeli health official tells Ynet that the Palestinian Authority rejected a offer by the Magen David Adom to transfer blood donations from Israel to the Gaza Strip. There was no explanation for the rejection given in the report. The official adds that if the Palestinian Health Ministry requests humanitarian aid, Israel will provide it with food, medicine and medical equipment. The World Health Organization and Palestinian Ministry of Health called for assistance in coping with a massive shortage of medicines, medical disposables and hospital fuel supplies last week. Israeli planes strike the home of former Hamas foreign minister Mahmoud al-Zahar, shortly after hits were reported on the houses of other senior Hamas officials in the Gaza Strip. According to a BBC reporter, nobody was in al-Zahar’s home at the time of the strike. Hamas’s al-Qassam Brigades claims it launched 99 rockets at Jerusalem, Haifa and Tel Aviv on its ninth day of operations against Israel. حصاد #القسام خلال اليوم 9 من #العصف_المأكول اطلاق 85 قذيفة صاروخية منهما صاروخ R160، و6 سجيل 55 ، و8 M75 وقصف حيفا وتل ابيب والقدس. The IDF says a total of 141 were fired into Israel on Tuesday. The house of former Hamas foreign minister Mahmoud al-Zahar was completely destroyed, according to reports from Gaza. 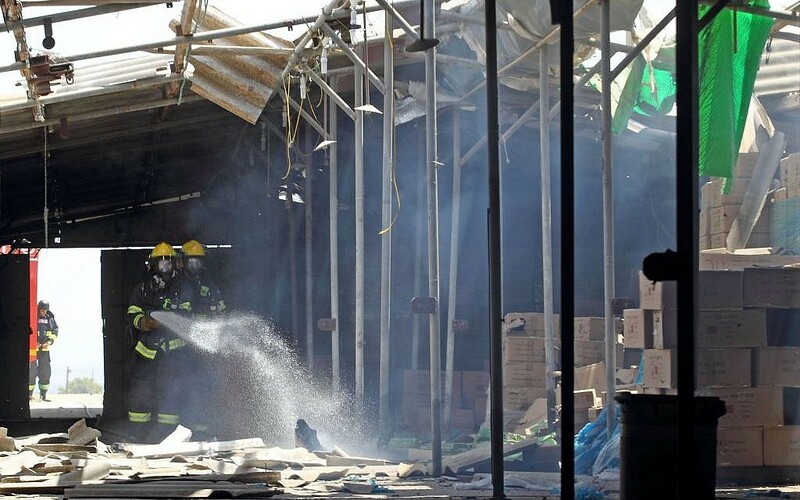 Two Palestinians were injured in the bombing. New Israeli air strikes bring the Gaza toll to 200, and over 1,500 have been injured, medics in the Palestinian territory say. Israeli planes have bombarded the Gaza Strip since midnight, targeting the Islamist group’s leadership. 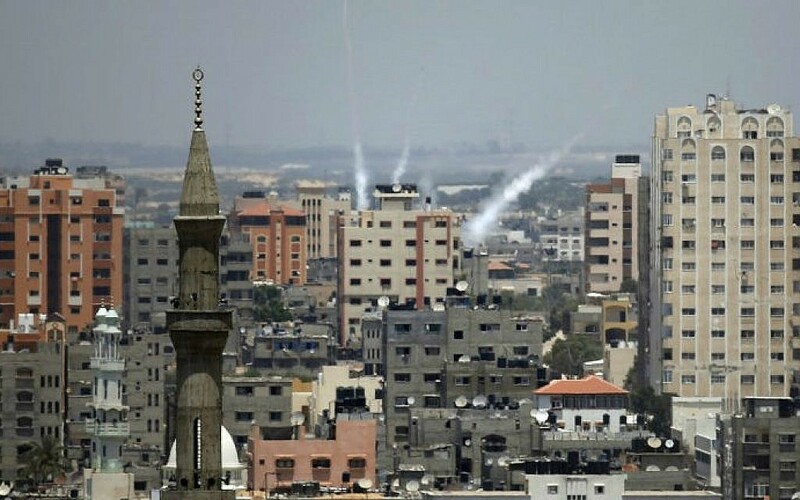 According to reports from Gaza, Israeli artillery shells killed a Palestinian man near the southern Gaza City of Khan Younis. After heavy bombardment of the Gaza Strip, the early morning silence is broken in southern Israel as rockets are fired at towns bordering the Palestinian territory. Code Red alerts are in effect in Nir Oz, Magen and the Eshkol region. Since midnight Israeli aircraft have carried out airstrikes on 25 targets in the Gaza Strip, including the homes of five senior Hamas officials. Three Hamas MPs, the former foreign minister and the former interior minister were among those whose homes were targeted in the airstrikes. According to Palestinian sources quoted by Israel Radio, 10 Palestinians were killed overnight in the airstrikes. 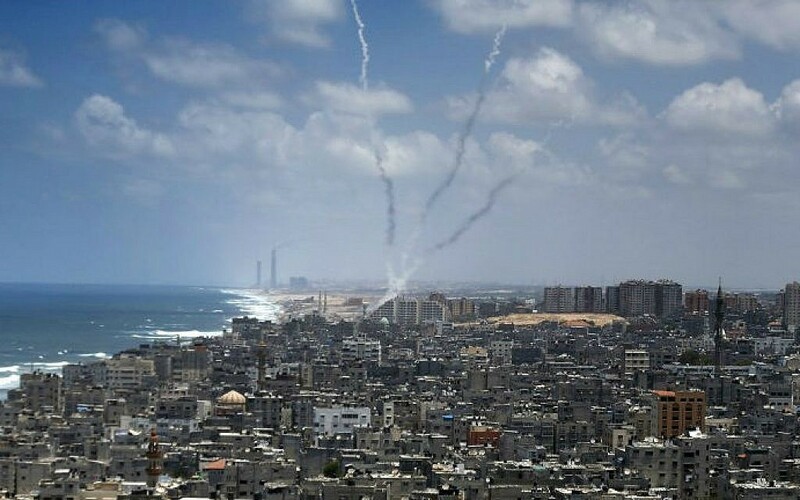 Gaza sends a large volley of rockets at Ashkelon and surrounding communities. Four of the rockets are shot down by Iron Dome, according to initial reports. Live TV in Israel shows the telltale puffs of smoke in the sky marking Iron Dome interceptions. The paper reports that despite assurances to Israel, Egypt failed to coordinate the offer to Hamas in any serious way, and drafted the agreement only in consultation with Israel. According to Palestinian sources cited in the report, Hamas stepped up attacks on Israel on Tuesday to improve its bargaining position. The paper also notes that the offer of US Secretary of State John Kerry to visit the region to push the deal was rejected by both Egypt and Israel, but still managed to put diplomatic efforts into overdrive. The IDF says eight rockets are fired at the southern city of Ashkelon in the latest volley — six are intercepted by the Iron Dome, and two fall in open areas. Pictures of the destroyed home of Hamas leader Mahmoud al-Zahar emerge on social media. There were no reports of casualties in the Israeli air strike on the home overnight. Al-Zahar, a former Gazan foreign minister, was most recently in the news for saying that no Hamas forces would come under the control of the Palestinian Authority, after a unity government was formed in June. In June, he warned that Hamas rockets could hit any city in Israel. A projectile that falls in an open area outside of Ashkelon sparks a brush fire near a gas station. Police and the fire department are on the scene. The Iron Dome shoots down two missiles over Kiryat Malachi, moments after sirens ring out in the region. A woman is lightly injured by shrapnel in Be’er Tuvia. Michal Olbasky tells Channel 2 she had just left her house and was running toward the local shelter when a fragment — most likely from an Iron Dome interception — fell in her yard. Clinton, reported to be mulling a 2016 presidential bid, noted on the comedy show that Israel had accepted an Egypt brokered ceasefire earlier that day, but Hamas rejected it. During the interview, she seemed to sympathize with Israel’s position. Dror Khenin — the 37-year-old who was killed by mortar fire near the Gaza border yesterday while distributing food to IDF soldiers — was a volunteer fireman and doting father, his friends say. “Unfortunately, he paid for his kindness with his life,” Cohen says. Khenin had arrived to a closed military zone with the Beit Aryeh security guard in a car stocked with food for the soldiers patrolling the border. Moments after they arrived, sirens sounded and Khenin, crouched behind a wall to protect himself, sustained a direct hit by a mortar. He was evacuated to the Barzilai Medical Center in Ashkelon, where he was pronounced dead. 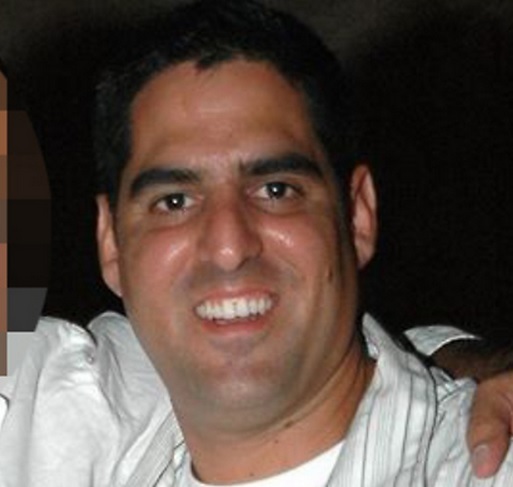 Khenin leaves behind his wife, Racheli, and three children: 10-year-old Shaked, six-year-old Yoav, and a baby girl, Avigail. 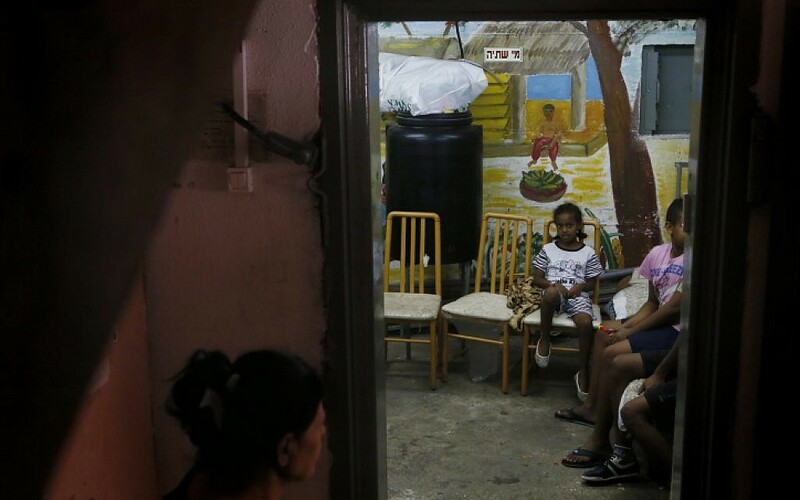 “The children don’t know anything yet, except that their mother went to visit their father,” a neighbor told Yedioth last night. Khenin’s brother is abroad on a backpacking trip and the family has not managed to get in touch with him to inform him of the tragic news, it reports. “It is so sad, and so symbolic that he was killed while offering moral support to the soldiers,” a Beit Aryeh resident writes in the town’s WhatsApp group. Ziad Nakhaleh, the deputy secretary-general of the Islamic Jihad, says he is working with Egypt to reformulate the conditions for a ceasefire with Israel. Sirens sound in the Dan and Sharon regions, including Ra’anana, Tel Aviv, Petah Tikva, Herzliya, and in the southern city of Ashdod. The IDF warns Palestinian civilians in the Beit Lahiya, Shuja’iya and Zeitoun towns in the Gaza Strip to evacuate their homes ahead of heavy airstrikes. “These messaged were conveyed by recorded and SMS text messages, as well as by leaflets,” the army says in a statement. News sources report the messages were sent to about 100,000 people. AFP correspondents saw flyers dropped over Zeitoun, and residents elsewhere also reported receiving recorded phone and text messages urging them to evacuate by 8 a.m.
“In spite of the ceasefire, Hamas and other terror organizations continued to fire rockets, therefore it is the intention of the IDF to carry out aerial strikes against terror sites and operatives in Shuja’iya/Zeitoun/Beit Lahiya. A high volume of rocket fire at Israel has originated in this area. The Iron Dome intercepts four projectiles over Tel Aviv, Channel 2 reports. Hamas claims responsibility for the recent barrage on central Israel. The terror organization posts on Twitter that it fired four M-75 rockets at Tel Aviv. The IDF says it struck 39 sites in the Gaza Strip and targeted four terror operatives during overnight operations. The latest airstrikes raise the total number of Israeli raids from the beginning of Operation Protective Edge to 1,750. An army statement also reveals success rate of the Iron Dome stands at 86%, with some 225 interceptions overall. Earlier the army had said the success rate was at about 90%. The IDF says that in the past nine days, 1,260 rockets have been fired from the coastal enclave, and 985 hit Israeli soil. Residents of Shuja’iya and Zeitoun near Gaza City are not evacuating their homes, in spite of the Israeli warning issued earlier this morning, Palestinian sources in the Gaza Strip tell The Times of Israel. Only a small number of Palestinian residents in the eastern neighborhoods of Gaza City have left since the army messages, urging civilians to leave by 8 a.m., were issued. This stands in contrast to the 18,000 residents of Beit Lahiya who left their homes earlier this week, following an IDF warning. Residents of Beit Lahiya were also urged for a second time to leave this morning. It is possible that having seen the IDF refrain from striking Beit Lahiya has encouraged the Shuja’iya and Zeitoun residents to stay put. MK Ze’ev Elkin (Likud) lambastes Finance Minister Yair Lapid for failing to appear in front of the Knesset Foreign Affairs and Defense Committee, which this morning discusses compensation arrangements for business owners and salaried employees impacted by Operation Protective Edge. 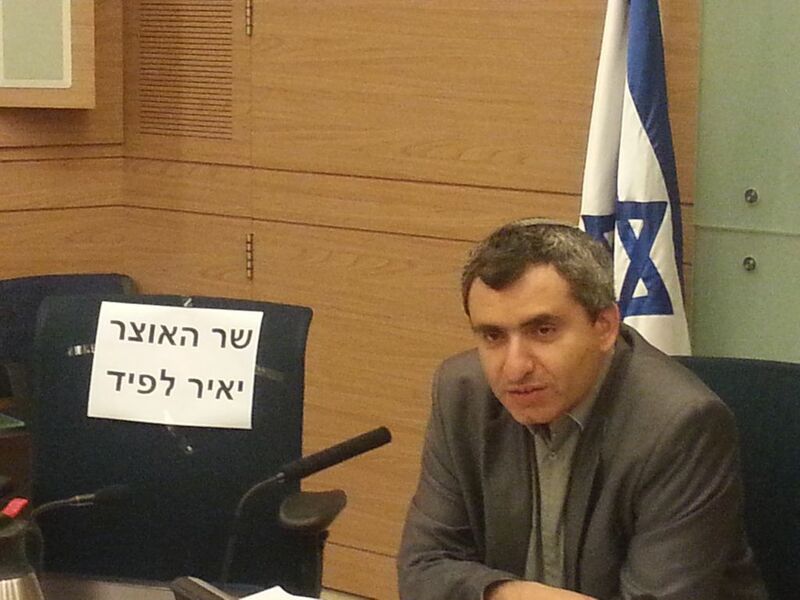 “Lapid’s empty chair resonates and symbolizes the contempt he has for residents of the south,” says Elkin, who heads the influential Knesset committee. Even if the residents of Israel’s southern periphery are not the main clientele of Lapid’s centrist Yesh Atid party, it is expected of a finance minister to take responsibility for all citizens, Elkin fumes. The dismissal attests to Hamas’s ability to undermine the Israeli government, and “reflects the depth of the crisis the resistance inflicted on the occupation,” he says. 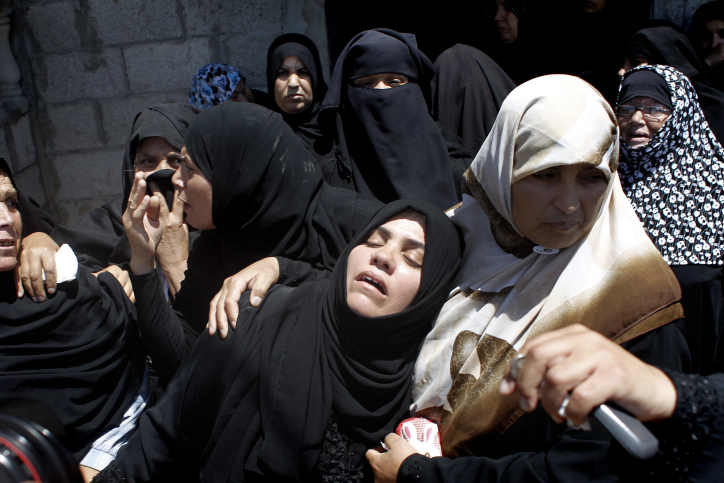 The Palestinian death toll in the Gaza Strip climbs to 205, medics in the coastal enclave say. A strike on a house in the southern city of Rafah kills two men, emergency services spokesman Ashraf al-Qudra tells AFP, and a separate raid kills a young man who witnesses said was an Islamic Jihad militant. Further Rafah strikes leaves two men dead, Qudra says, while a raid on the home of Mohammed al-Arjani in the southern city of Khan Yunis kills his son Abdullah, 19. About an hour later, tank fire from inside Israel hits the eastern part of Khan Yunis, killing one person, Qudra says, later adding that another man was slain there, 33-year-old Mahmud Abu Dakka. “There is no need to worry about these (warnings), or deal with them. Do not respond to them in any way,” an interior ministry statement said. The IDF leaflets were distributed to some 100,000 Gaza residents. The IDF targets underground rocket launchers in the northern Gaza Strip town of Beit Lahiya, hours after it issued a second warning to residents to flee, Ynet reports. The airstrikes are also designed to encourage the residents to leave ahead of heavier raids, it reports. There are no immediate reports of casualties. 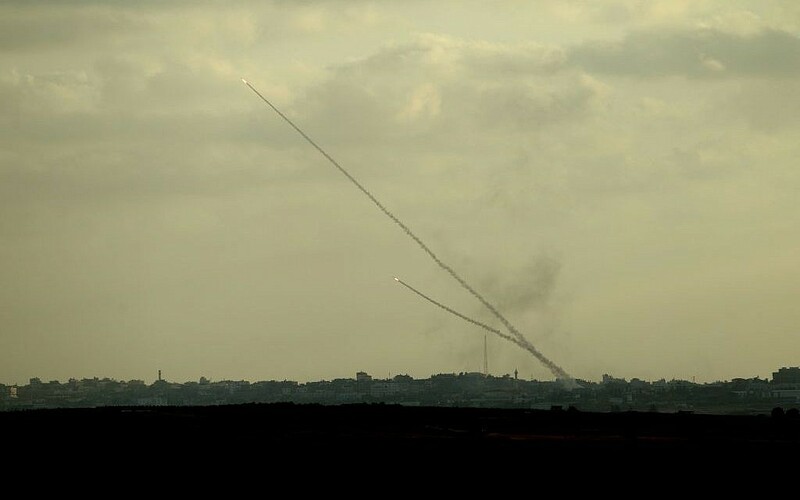 Seven missiles land in open areas in the Eshkol region. No injuries or damage is reported. 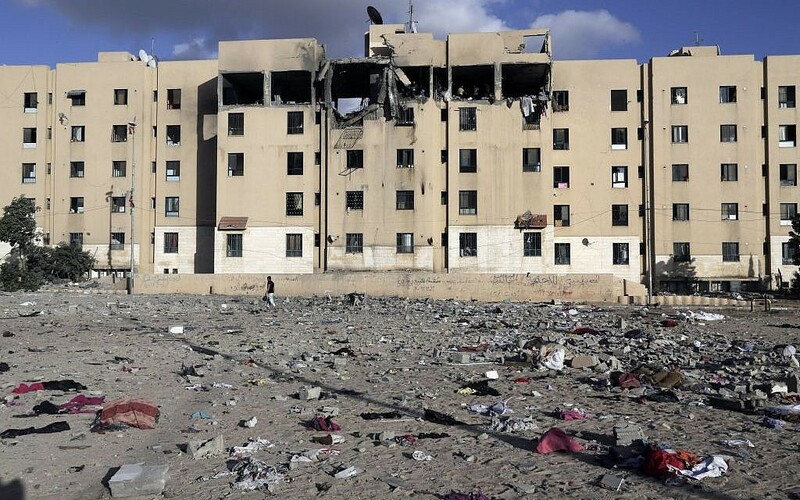 The Wafa Rehabilitation Center in Shuja’iya, which cares for 15 disabled and elderly patients, received several calls from the Israeli military demanding the patients evacuate, says its director, Basman Ashi. Ashi says an Israel shell hit near the building, causing damage to the second floor, but no injuries. Ashi says he won’t evacuate his elderly patients because they have nowhere to go. Four foreign volunteers — from England, the US, France and Sweden — set up camp at the rehabilitation center to deter the military from targeting it. English volunteer Rina Andolini, 32, says the patients range in age from 12 to over 70 and none can walk or move without assistance. She says there are also 17 Palestinian staff members. Andolini says the patients are living in a constant state of fear, intensified by the Israeli tank shelling from across the border. The South African Jewish Board of Deputies files a formal complaint with the country’s Human Rights Commission over an anti-Semitic Facebook post by a official from the African National Congress, the ruling party. Smit’s post constitutes a serious breach of the Prohibition of Hate Speech as contained in The Promotion of Equality and Prevention of Unfair Discrimination Act, the Board of Deputies says in a statement. Specifically, Smit violated the prohibition of unfair discrimination by way of “the dissemination of any propaganda or idea, which propounds the racial superiority or inferiority of any person,” the organization says. Italian Foreign Minister Federica Mogherini, in Israel on a state visit, tells President Shimon Peres the Gaza death toll is “extremely worrying,” and calls for an immediate ceasefire. 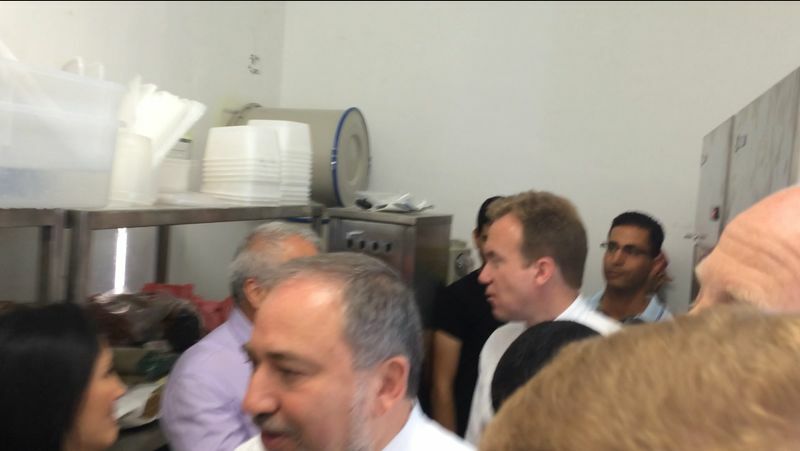 “My visit in Ashdod yesterday showed me the strong physical and psychological pressure on the people. As a mother I understand very well the pressure and the tension there and at the same time the number of civilian victims in Gaza is extremely worrying. I think it’s in the interest of the Israeli and Palestinian people, especially in Gaza, to stop this,” she says. Gaza health officials say the death toll stands at 205, after over eight days of fighting. It is not clear how many of those are civilians. Mogherini also addresses the increased radicalization in the Middle East, and growing anti-Semitism in Europe. “The region is tense and there is the risk of radicalization in the Arab world and also in Europe, where we know we have to pay attention to the risk of anti-Semitism, especially in these days,” she says. “We’re trying to defend our own people, as we must, and we’re also trying hard not to hit innocent people in Gaza,” he adds. Israel’s ambassador to South Africa, Arthur Lenk, will be summoned to the country’s Foreign Ministry in Pretoria to explain Operation Protective Edge, South African media reports. International Relations Minister Maite Nkoana-Mashabane told SABC News that Lenk will be called in to explain Israeli airstrikes on Gaza, which so far have reportedly killed over 200 Palestinians. According to pro-Palestinian activists, the topic #ExpelIsraeliAmbassadortoSA has been trending for days now on Twitter in South Africa. A separate Twitter feed solely designated to advocate expelling Lenk so far has 138 followers. South Africa’s ruling party, the African National Congress, has been exceedingly critical of Israel’s campaign against terrorists in Gaza, who have shot more than 1,000 rockets at Israeli civilians. Amid continuous rocket fire from the Gaza Strip, some 400 French Jewish immigrants — including 195 minors and 18 babies — will land in Israel later today. Sixty of the new arrivals will be moving to the southern cities of Ashdod and Ashkelon, both of which continue to be pummeled by rocket fire from the Gaza Strip. One hundred immigrants will be moving to Tel Aviv and central Israel, 130 will move to the coastal city of Netanya, and approximately 50 to Jerusalem, according to a statement from the Jewish Agency. 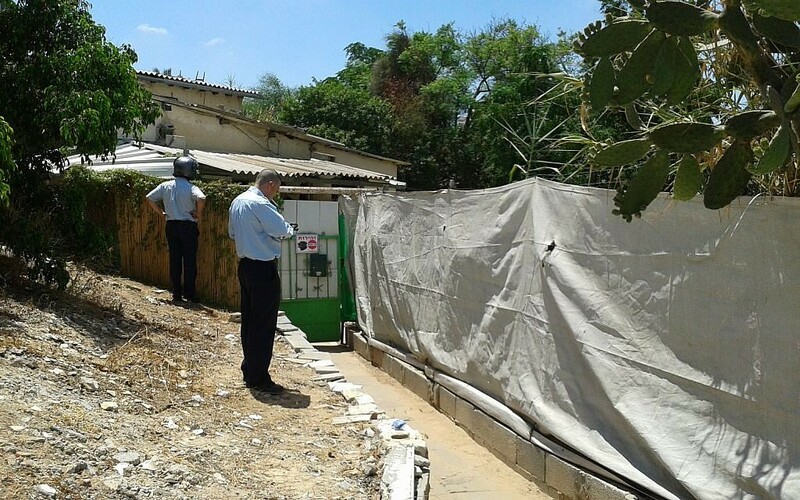 A residence in Kfar Shalem in south Tel Aviv sustains damage from rocket fragments, after the Iron Dome intercepts projectiles over the city earlier this morning. The shrapnel penetrates the roof, punching a hole through one of its bedrooms. Family members tell Channel 2 the shrapnel hit their home a full five minutes after the interception. Another fragment falls near a school in Bnei Brak. Children receive medical treatment for shock on the scene. The production crew for the FX TV series “Tyrant” moves its filming location from Israel to Turkey as rocket fire from the Gaza Strip continues, Variety reports. Three Palestinians are killed in a fresh Israeli airstrike in the southern Gaza Strip, an emergency services spokesman says. Witnesses tell AFP a missile struck a car in the southern city of Khan Yunis, with emergency services spokesman Ashraf al-Qudra confirming three people are killed and another five wounded. Five projectiles land in open areas in the Eshkol region. Sirens wail in the southern city of Beersheba and surrounding communities. The State Attorney’s Office announces that the state will file an indictment against those suspected of murdering Muhammad Abu Khdeir earlier this month. The indictment will be filed in Jerusalem District Court, at 11 a.m. on Thursday. A woman and a child are among three Palestinians killed on Wednesday in an Israeli airstrike in the southern Gaza Strip, an emergency services spokesman says. In a statement, Ashraf al-Qudra confirms three people from the Abu Daqqa family had been killed in a strike in Khan Yunis, including a 65-year-old woman and a 10-year-old boy. Witnesses tell AFP the missile struck a car in the eastern Bani Suheila neighbourhood. Earlier on Wednesday, another member of the Abu Daqqa family was killed in a separate strike on the city. A rocket falls inside a community on the outskirts of the Gaza Strip, moments after the sirens sound in the region. A building was lightly damaged, Channel 2 reports. Hiddush, an NGO promoting religious freedom in Israel, denounces the segregated shelters in an Ashdod rabbinical court. “This case proves how important it is to advance legislation under which discrimination against women in the public sphere will be a criminal offense,” Rabbi Uri Regev, the head of Hiddush, says in a statement. Regev sounds a call for civil marriage in Israel, which would allow Israelis to stay away from the “dark” institution of the rabbinical court. The case in question was the subject of heated debate in the 2012 Operation Pillar of Defense as well, when pictures of the court’s gender-segregated bomb shelter sparked fury on social media. In a visit to Ashkelon, Foreign Minister Avigdor Liberman calls for a ground offensive in the Gaza Strip to restore quiet in the south. “We cannot promise a normal summer for our children without a ground incursion in Gaza,” he says. Liberman says the Israeli government does not need to control Gaza, or settle it, but it must rid the coastal enclave of its terrorists. He cites the practice of hiding rockets and launchers in densely populated areas as the reason a ground operation is needed, saying they can’t be hit from the air without sustaining massive collateral damage. He also calls for international community to give full support to Israel’s actions. But on how best to accomplish that, he says, there are differences of opinion. The foreign minister has called for ground invasion several times since the operation began. Sirens blare in Kiryat Gat and the surrounding areas, as well as in the Ashdod region — but not in the city itself. The Palestinian Authority will propose to Egypt that it open the Rafah crossing between Gaza and Egypt under the surveillance of PA security, as part of the negotiations to broker a ceasefire between Israel and Hamas. PA President Mahmoud Abbas will present this offer to the Egyptian president during their meeting in Cairo tomorrow. He is also set to meet with Hamas leader Khaled Mashaal in either Cairo or Ankara. Hamas has demanded that the Rafah crossing be opened, as part of its requirements for a truce. Israel is not expected to oppose the measure, if PA forces are deployed to man the crossing, official sources say. Sirens sound in Dimona, Arad, and Yeruham. A large pro-Palestinian march in Paris is scheduled for Saturday, and has already garnered 5,300 people planning to attend, according to the event’s Facebook page. In an anti-Israel protest in Paris on Sunday, violent clashes erupted in the city, and hundreds of Jews were trapped in a synagogue. The Iron Dome intercepts a missile over Kiryat Gat. Additional rockets targeting Dimona and Yeruham land in open areas, causing no injuries or damage. A Washington Post editorial lambastes Hamas’s “stomach-turning” tactics, arguing that the terror organization seeks Palestinian civilian deaths to gain international favor. The paper also praises the Israeli military measures to limit civilian casualties in the Gaza Strip. “Why would Hamas insist on continuing the fight when it is faring so poorly? The only plausible answer is stomach-turning: The Islamic movement calculates that it can win the concessions it has yet to obtain from Israel and Egypt not by striking Israel but by perpetuating the killing of its own people in Israeli counterattacks. More than 200 people, including a number of children, have already died in Gaza; Hamas probably calculates that more deaths will prompt Western governments to pressure Israel to grant Hamas’s demands,” it writes. Hamas’s conditions for a ceasefire call for a ten-year truce, and the release of the prisoners originally freed during the 2011 prisoner swap for IDF soldier Gilad Shalit and rearrested after the June 12 killing of three Israeli teenagers, Channel 2 reports. In addition, the terror organization demands that all crossings to the Gaza Strip be opened, and that the Rafah crossing to Egypt be secured by UN forces. It calls for an airport to be established in the Strip, that fishing areas be expanded, and that Israeli aircraft alter their flight routes such that none fly over the coastal enclave. France says the European Union could set up observer missions at border crossings between the Gaza Strip and Israel to try to encourage a lasting truce between the two sides. “Europe… is ready to do things, particularly through what we call EUBAM, which are forces that could monitor movements between Gaza and Israel,” Foreign Minister Laurent Fabius tells French radio. In cooperation with Palestinian and Israeli officials, the mission of 70 European police officers monitored movements of people, goods and vehicles at the Rafah crossing, Gaza’s only window to the outside world that bypasses Israel. The Iron Dome intercepts two missiles over the southern city of Ashkelon. A third rocket falls outside a house in a residential area, close to where Foreign Minister Avigdor Liberman and Norwegian Foreign Minister Børge Brende are located, according to Ynet. The structure is damaged, but no injuries are reported. Two other missiles land in open areas. The Hebrew NRG news website presents ten conditions Hamas is demanding for a ten-year ceasefire, citing a senior Palestinian official as its source. The first condition is that the IDF withdraw its tanks deeper into Israel, allowing Palestinian farmers access to land close to the Gaza-Israel border. The terror group calls for the release of all prisoners arrested as part of the Operation Brother’s Keeper, following the June 12 abduction of Naftali Fraenkel, 16, Eyal Yifrach, 19, and Gil-ad Shaar, 16. Hamas demands the blockade be lifted on all its borders. It says the Rafah crossing must be opened and placed under UN control, calls for the establishment of an airport and port under UN supervision, and asks to expand its fishing zone by ten kilometers. Hamas says the borders of the Gaza Strip must be manned by UN troops, and says Israel must not intervene in the Fatah-Hamas reconciliation agreement and Palestinian unity government. The list of demands also says Israel must ease the restrictions for Palestinians seeking to pray on the Temple Mount, and calls for boosting development in the coastal enclave and restoring its infrastructure. The Prime Minister’s Office declines to comment on the reports detailing Hamas’s conditions for a ceasefire with Israel. 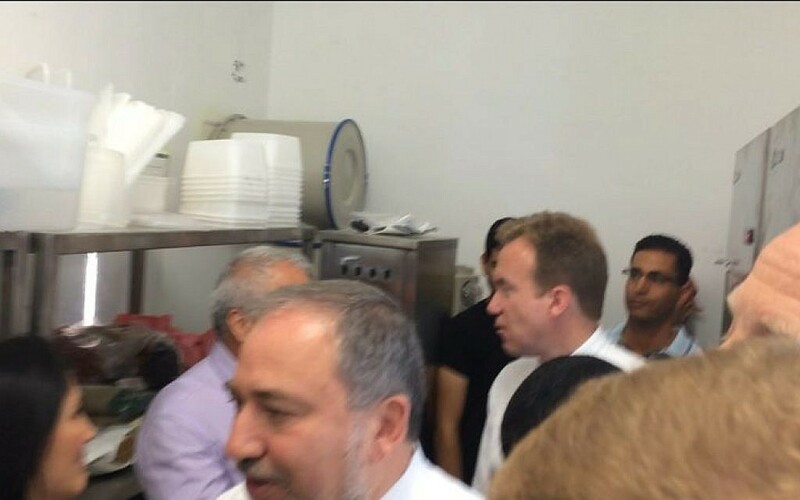 During the course of a joint visit to Ashkelon, Foreign Minister Avigdor Liberman and Norwegian Foreign Minister Børge Brende scurry for shelter after rockets target the southern city. “Our children deserve a safe summer, without fear,” he says, according to Channel 2. Thirty-seven rockets hit Israel today, as of Wednesday afternoon, and 23 were intercepted by the Iron Dome, the IDF says. Hamas has fired 61 rockets today. 37 of them hit Israel; 23 were intercepted by Iron Dome. Two missiles fall in the Ashkelon area, and five others land in open areas in southern Israel, the army says. A few minutes ago, 2 rockets fired from Gaza struck the Ashkelon area, and 5 rockets struck elsewhere in southern Israel. Hamas just sent out a mass text message to Israelis in which it bashes the Israeli government for not meeting its demands for a ceasefire. “Your government claimed yesterday that it ceased fire, but without agreeing to carry out our conditions and it thinks that we will hasten to cease fire, but to the contrary, we hurried to strike every place in Israel, from Dimona to Haifa, and we forced you to hide in shelters like mice,” the text says. “We again caution: if your government doesn’t agree to all our conditions, lo all of Israel will remain a legal target for our fire,” Hamas says. A Hamas official in Gaza tells The Times of Israel that Egypt will remain the mediator between Israel and Hamas as part of the ceasefire efforts. He says Hamas was angered by the publication of the details of the Egyptian proposal, which came as it was handed over to a Gaza representative, and without Cairo’s consultation with Hamas. “But we didn’t say we don’t want the Egyptians. They didn’t consult with us, but the connection with them continues. The contact between the Egyptian intelligence and Hamas remains unchanged. There are many officials attempting to mediate, but there is no viable channel other than the Egyptians,” he says. Tomorrow, Hamas’s representative in Egypt, Moussa Abu Marzouk, will meet with PA President Mahmoud Abbas in Cairo. From there, Abbas will travel to Ankara where he may meet with Hamas leader Khaled Mashaal. Hamas officially rejects the failed Egyptian ceasefire that fizzled on Tuesday. “The outcome of discussions within the internal institutions of the movement was to reject the proposal and therefore, Hamas informed Egypt last night it apologizes for not accepting it,” spokesman Sami Abu Zuhri is quoted by Reuters saying. A Hamas official is to hold talks in Cairo on Wednesday about Egyptian-led efforts to end the nine-day conflict between the Gaza-based Islamist movement and Israel, the Palestinians say. “A meeting will be held this afternoon between an official from Hamas and a representative of the Egyptian leadership,” says Azzam al-Ahmad, a senior member of Palestinian president Mahmud Abbas’ Fatah movement. Speaking at a meeting of the Arab League, Ahmad voices hope that those at the gathering would “crystallize a definite formula for an Egyptian initiative” or clarify Cairo’s plan, which proposed an end to hostilities from 0600 GMT on Tuesday. Prime Minister Benjamin Netanyahu holds a joint press conference with visiting Italian Foreign Minister Federica Mogherini. He says that Hamas is launching rockets at Israel and killing Israeli citizens, and that attempts by Israel to find a diplomatic solution were unsuccessful. He points out that Israel ceased fire on Tuesday for six hours and Hamas rejected it and responded with additional rocket fire. He says that if Florence or Milan were bombed, Italy would not tolerate it. Mogherini calls on Hamas to reconsider its decision to reject the Egyptian ceasefire proposal and accept a truce. She expresses concern over the civilian casualties in Gaza, and says she hopes that a solution to the crisis is found soon. Four Palestinian children are reported killed in an Israeli bombardment on a beach in the Gaza Strip, Palestinian medics in the Gaza tell reporters. Hamas’s social media also reports the incident. Red alert sirens are sounding in Ashkelon and in the communities surrounding the Gaza Strip as rockets fired from Gaza are launched at Israel. At least one rocket is downed by the Iron Dome over the southern town of Sderot. No injuries or damage are reported in the latest barrage on southern Israel. Red alert sirens in Netivot, Sdot Negev and Eshkol regions of southern Israel. No immediate report of rocket impacts. The Hamas Health Ministry names the four kids killed on the Gaza beach by an Israeli naval bombardment as Zakaria Ahed Bakr, 10, Ahed Atef Bakr, 10, Mohammed Ramez Bakr, 11, and Ismail Mohammed Bakr, 9. There was no immediate comment from the IDF on the reports of the killed Palestinian children. Hamas claims responsibility for firing three rockets at the southern town of Netivot moments ago. Two rockets were reported intercepted by the Iron Dome missile defense system. A series of photos circulating on Twitter claims to show the moment an Israeli shell struck and killed four Palestinian children near the beach in Gaza City. The authenticity of the images could not be independently confirmed. 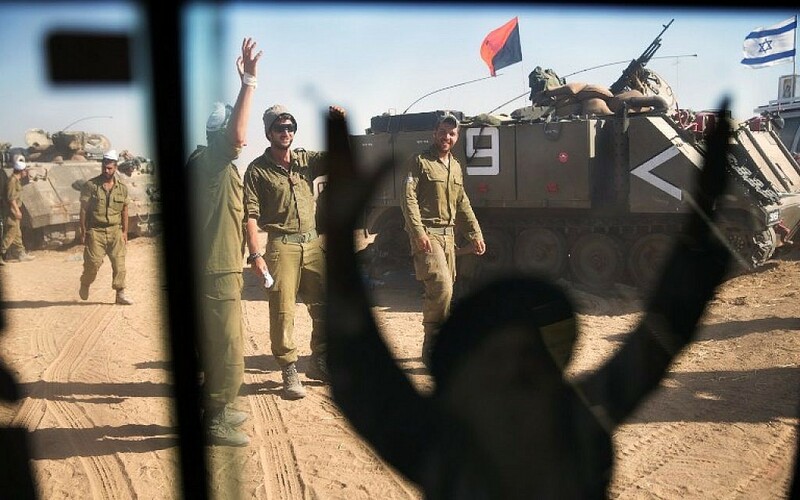 The cabinet approves the call-up of another 8,000 IDF reservists, Channel 2 reports, which would bring the maximum number to 50,000. 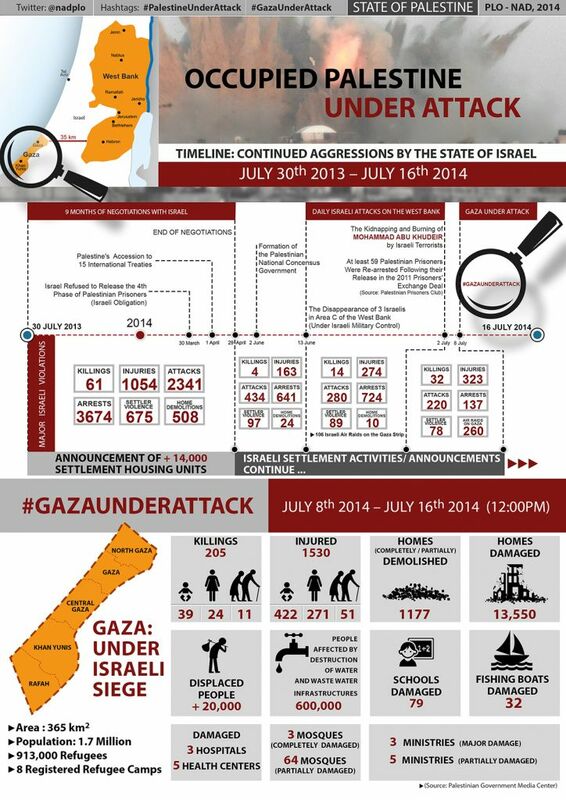 The PLO’s Negotiation Affairs Department joins the media fray and publishes an infographic detailing what it calls the “continued aggressions by the State of Israel” from July 30, 2013 — the date American-mediated negotiations began last summer — and July 16, 2014. Among the statistics it puts in the cluttered and often confusing chart, it claims that Israel killed 111 Palestinians in the past year, not including the 205 killed in Operation Protective Edge, and arrested over 5,000. Sirens are heard in Eshkol region bordering the Gaza Strip. Sources in Egypt and in the Hamas movement say reports earlier today of a Hamas offer that would see a ten-year truce between Hamas and Israel are inaccurate and should be taken with a grain of salt. According to Gaza-based al-Aqsa TV, Hamas tells Arab states that it feels betrayed and is disappointed in them. The Palestinian Authority will ask to join the Rome Statute of the International Criminal Court, which means that it will be able to sue Israel for war crimes, a senior Palestine Liberation Organization official says. If Israel’s campaign in Gaza continues, the letter will be sent “sooner rather than later,” she threatens, refusing, however, to say when exactly the PA plans to join the ICC. The situation is dynamic and continuously evolving, and we know you care about what’s happening over here. So, if you’re glued to the liveblog and want to get alerts on the go, you can also follow @TOIAlerts on Twitter — we’re live-tweeting all the updates there as well. Six rockets fired from Gaza were fired at the southern city of Ashkelon, one of which was intercepted by the Iron Dome missile defense system. The remainder fall in open areas outside town. A Palestinian health official reports that a new Israeli airstrike in Khan Yunis killed four. A tweet by Hamas’s Al-Qassam Brigades says that an Israeli airstrike killed one and injured two Palestinians. It wasn’t clear whether the reports were referring to the same Israeli strikes. The IDF is investigating the reported deaths of four Palestinian children on the beach in Gaza from an Israeli shelling earlier this afternoon. According to Israel Radio, the Israeli military has appointed Maj. Gen. Noam Tibon to investigate all Israeli strikes on the Gaza Strip during Operation Protective Edge in which noncombatants were killed. The death toll in the more than weeklong conflict has risen to over 212 Palestinians, of which the IDF says half are noncombatants. “If you want to efficiently fight terrorism you must be present, boots on the ground,” the official tells the US paper. According to Channel 2, Israel will wait on a ground invasion until it sees the results of Egyptian efforts to mediate a ceasefire. Four rockets are fired at the coastal cities of Ashdod and Ashkelon from the Gaza Strip, of which at least two are intercepted by Iron Dome missiles. There are no reports of injuries or damage from the other two rockets. 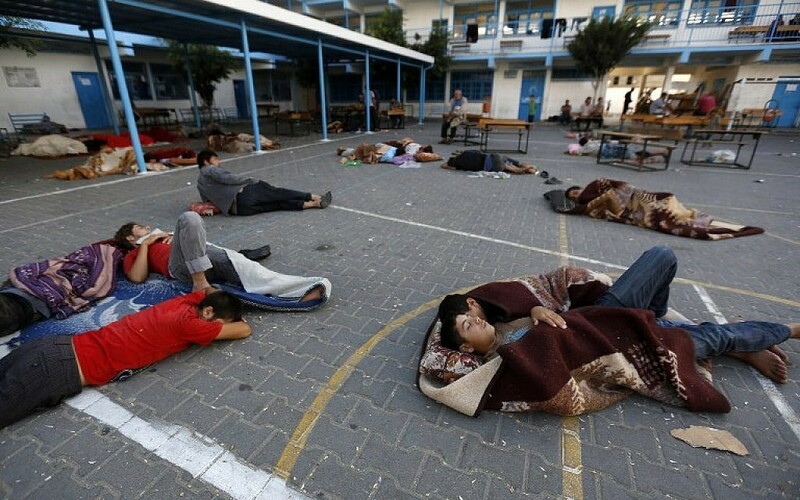 A rocket explodes in a schoolyard in Ashdod shortly after a barrage is launched from the Gaza Strip. No injuries are reported, and the extent of the damage is still unclear. The chief IDF spokesperson relates to the death of four Palestinian children earlier in the day on the beach in Gaza, saying the incident is under investigation but that Hamas is responsible. “There was a [military] target embedded among civilians,” says Brig. Gen. Moti Almoz, the IDF spokesperson. The UN requests a six-hour break in hostilities from both Israel and Hamas for humanitarian purposes. Channel 2 correspondent Udi Segal says UN envoy Robert Serry asked Coordinator of Government Activities in the Territories Maj. Gen. Yoav Mordechai for a six-hour humanitarian truce that Israel would initiate and Hamas would then join. Israel is said to be weighing the proposal. Sirens sounded in the southern cities of Ashdod and Kiryat Malachi and surrounding towns, and at least three rockets are reported intercepted by Iron Dome. Israel has accepted UN envoy Robert Serry’s request for a six-hour humanitarian ceasefire in the Gaza Strip. The one-sided ceasefire is expected to begin Thursday morning. “Hamas’ cynical exploitation of a population held hostage has caused the IDF to cancel strikes on terrorist targets on multiple occasions this operation,” the IDF says. Unconfirmed Palestinian media reports say the IDF has struck multiple targets in the southern Gaza Strip, including a motorcycle and a house in the city of Rafah. Al Aqsa TV reports an Israeli airstrike destroyed a house in Rafah. The station also says two Palestinians were injured when the IDF struck their motorcycle en route to launching rockets. The United States is doing “everything in our power” to end the bloodshed in the Gaza Strip, Secretary of State John Kerry says, as he keeps up contacts with regional leaders. 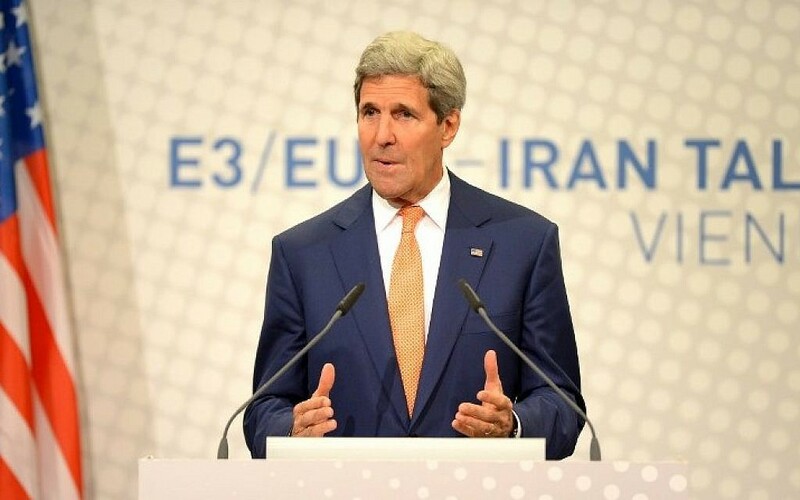 “Our concern is to have a legitimate ceasefire and see if we can find a way to stop the conflict and killing so we can get to the real issues that are underlying it,” Kerry tells reporters as he meets his counterpart from Luxembourg. “And we’re doing everything in our power,” says Kerry, adding that he has been speaking to Prime Minister Benjamin Netanyahu and Arab officials. The head of the Coordinator for Government Activities in the Territories Maj. Gen. Yoav Mordechai tells BBC Arabic that Israel has agreed to a five-hour humanitarian ceasefire that will take effect Thursday morning at 10 a.m.
Mordechai adds that any rocket fire by Hamas during that window will be met with Israeli retaliation. The Israel Democracy Institute releases a report assessing the legal limitations of Israel’s military actions in Gaza during Operation Protective Edge, focusing on target selection, proportionality, and the obligation of warning civilians prior to attack. Noting at the outset that Hamas’s action over the past nine days – firing indiscriminately at civilians and hiding among them – “constitute war crimes,” the authors state that the report, nonetheless, examines “the restrictions incumbent on the State of Israel” and not the violations perpetrated by Hamas. “The most basic principle of the law of war,” the authors write, “is the principle of distinction” – between civilian and military targets. Israel, in this asymmetrical conflict, may strike any civilian target so long as it is also being used for military purposes and complies with the principles of proportionality, they state. The duty of advance warning, the authors write, is not obviated by the fact that Hamas does not allow civilians to leave the area. 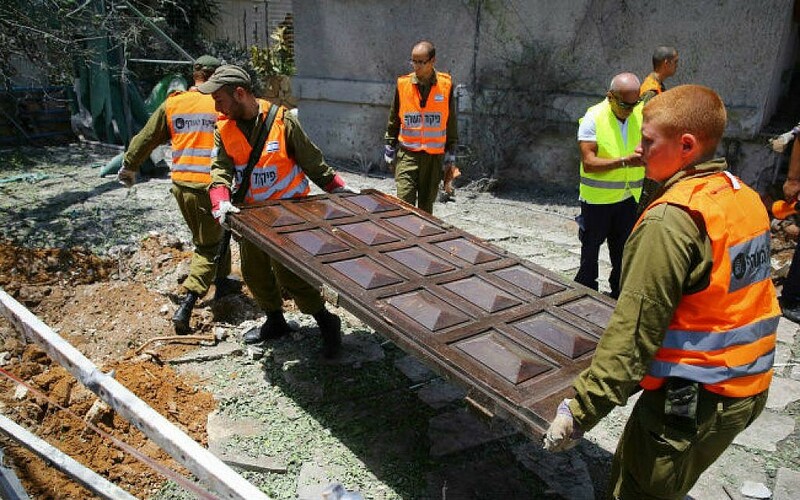 The IDF spokesperson says it has agreed to a “humanitarian window” on Thursday, July 17 between 10 am. and 3 p.m..
Abu Zuhri also states that Hamas will not accept a ceasefire initiated by the Palestinian Authority, NRG reports. “The Palestinian Authority must respect the blood of the Palestinians and the position of Hamas and the resistance organizations, not work against it,” Abu Zuhri says. The Lebanese army locates two rocket launchers aimed at Israel south of Tyre. The launchers are found in an area from which rockets were fired at Israel in recent days. Earlier today, Lebanese security forces arrested two Palestinians suspected of firing rockets into Israel in recent days. With the four children killed on the Gaza beach earlier Wednesday, the number of Palestinians minors who have died in the conflict reaches 50, Channel 10 reports. The end of another bloody, bitter day of Hamas rockets at Israel, and Israeli strikes at Hamas targets in Gaza. There’s a five-hour humanitarian time-out set for Thursday morning, and Israel, the PA, Hamas and others have teams in or heading to Cairo for ceasefire talks… but there’s no sense at all that Israel’s demands for longterm calm, and Hamas’s ceasefire terms, are reconcilable. For now, the hostilities continue. We’re going to close this live blog now, and our colleague Lazar Berman is starting a new one here. Remember, you can also follow @TOIAlerts on Twitter — we’re live-tweeting all the updates there as well.